STEMvision™ is a bench-top instrument and computer system designed specifically for automated imaging and counting of hematopoietic colonies in the colony-forming unit (CFU) assay. Instead of manually identifying and counting colonies using a microscope, the user simply loads a SmartDish™ culture plate containing up to 6 individual CFU assays in MethoCult™ medium into the automated CFU counter. The instrument captures an image of each 35 mm well, which is then analyzed using specialized software for each type of assay. By using an automated CFU counter to standardize colony counting, cord blood banks, transplant labs and research labs can ensure that their CFU assay results are accurate and reproducible. INCREASE ACCURACY. Achieve more accurate colony counts than with manual counting. REDUCE VARIATION. Software reduces inter- and intra-individual and laboratory variation in colony counting. SAVE TIME. Standardized software reduces the time it takes to train new students and staff to recognize and count colonies. KEEP TRACK OF YOUR DATA. Culture wells are digitally imaged for permanent record keeping. 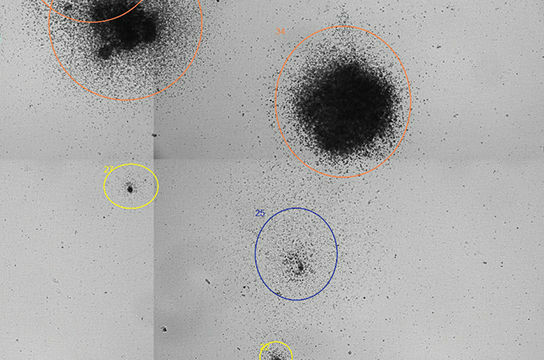 These images have been analyzed by STEMvision™ Human (A) 7-Day and (B-D) 14-Day Analysis Packages. 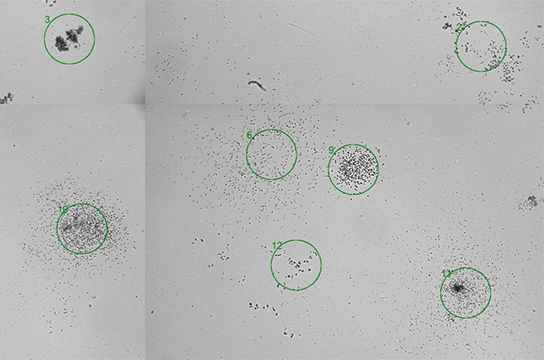 Green circles identify individual colonies in a 7-day cord blood CFU assay that scores total CFUs only (A). 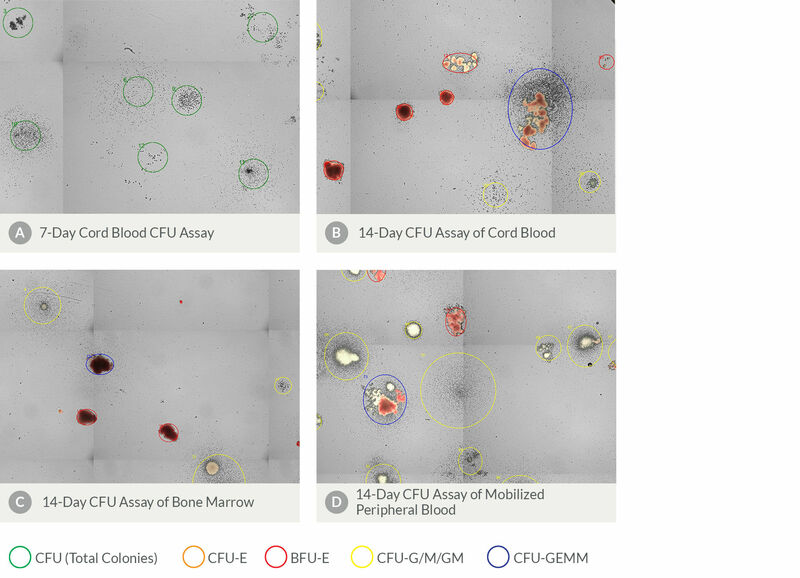 Orange and red circles identify erythroid colonies, yellow circles identify myeloid colonies and blue circles identify mixed colonies in 14-day cord blood (B), bone marrow (C) and mobilized peripheral blood (D) CFU assays. Erythroid and mixed colonies that contain hemoglobinized cells are shown in true red color. 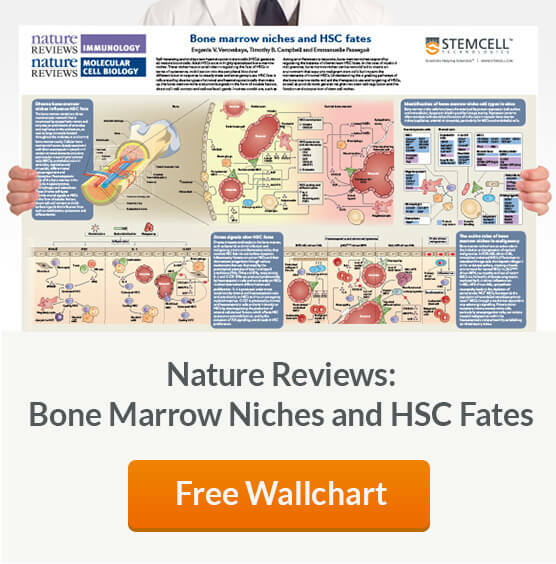 Images of mouse bone marrow cells cultured in (A) MethoCult™ GF M3434, (B) MethoCult™ GF M3534 and (C) MethoCult™ SF M3436 were acquired using STEMvision™. The corresponding STEMvision™ Mouse Analysis Package (i.e. 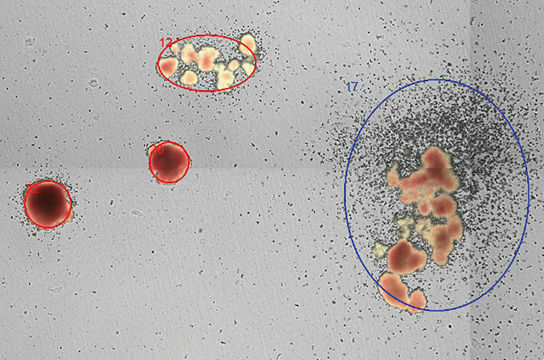 Total CFU Analysis Package (A), Myeloid CFU Analysis Package (B) or Erythroid CFU Analysis Package (C)) was used to analyze each image. Red circles identify the smallest colonies - size class 1, yellow circles - size class 2, blue circles - size class 3 and orange circles identify the largest colonies - size class 4.